This is (obviously) a new post on my Ephems blog. This time it’s also an advertisement. My first (and only) book, What Diplomats Do: the life and work of diplomats, was published in the United States and Britain in July 2014 as a hardback and e-book, and only now, in May 2016, in paperback, by Rowman & Littlefield, the US publishers. Its appearance now in paperback, with a new cover, puts it within easy reach of almost all wallets, especially with the handsome publishers’ discount now on offer until the end of 2017 – the original expiry date for the UK£ discount of end September 2016 has now been helpfully extended by the US publishers to the end of 2017. With the discount, the paperback edition costs under £15 (UK and international) and under $20 (North America). What Diplomats Do is not a diplomatic memoir about my own career, nor a textbook for students and teachers of the history and practice of diplomacy, nor a novel about the life and work of an imaginary diplomat – but it comprises elements of all three, thus informing and entertaining at the same time (I hope). It is written for the ordinary lay reader with an interest in politics and international affairs as well as for students and teachers who specialise in them and for those from any country contemplating or already experiencing a career in diplomacy. It is already in use as a teaching tool at a number of universities in the US, UK and elsewhere. The paperback edition makes an excellent present for your hosts at your forthcoming dinner parties as a change from flowers or a bottle of Argentine Malbec. And it’s a natural for your book club or literary circle. There are fuller details of the book, and how to buy it, on my website at http://www.barder.com/wdd/ , where you will find a guide to buying in UK££ or US$$, including 25% and 30% discounts respectively (until 31.12.2017). In the case of UK£ purchases you will find an order form with an email address for your order: for US$ buyers, a website address. 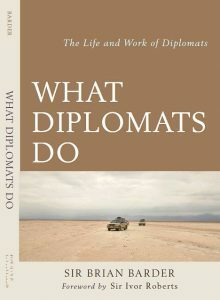 There are also links to the many enthusiastic reviews of What Diplomats Do, and some sample chapters free to read online or to download, with pictures of the front covers of both the paperback and hardcover versions of the book, all at http://www.barder.com/wdd/. Do please have a look. And if you decide to buy a copy, in whatever version, don’t forget to quote the code in the order forms in order to qualify for the discount — WHDD25 for UK£ buyers, 4M14WDIPLO for buyers in US$. I promise that this is the last commercial on http://www.barder.com/ephems/. Probably. PS: This blog post is open for comments here on What Diplomats Do but only, please, by those who have read the book — or at least have bought it.